One of the latest trends taking homeownership by storm is portable housing. 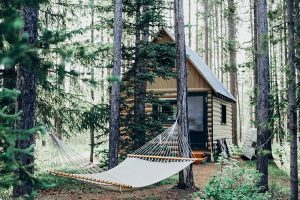 Whether the tiny home fad has you captivated or you are curious about living in a mobile home, there has recently been a surge of popularity with the “on-the-go” lifestyle. With these alternative housing situations, a whole new perspective on travel has emerged and it is transforming people’s concept of home. Especially among the younger millennial generation, the age of settling down is slowly getting blurred. More and more people have stopped searching for the perfect home and have embraced the search for the perfect habitat. This trend is so much more about finding a space that works for you. It is about incorporating a space that meets your goals and then taking the “convenience of home” with you on your journey. It is about bringing only the fundamentals and living minimally but living fully. This is a perfect way to stay within your financial means, while at the same time, see the world up close and personal. When dealing with mobile home and tiny home layouts, every square foot counts. It’s not about the quantity of space, it’s about how that space is used. 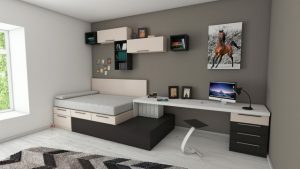 Lofted beds and foldaway tables are just a few examples of how to double up your necessities and avoid crowding the communal space. Here are a few benefits on how mobile home lifestyles can help you capitalize on your lifestyle, without compromising your style. When some people think of mobile homes or tiny house living, one of the first things brought up is space or feeling claustrophobic. With a proper layout and the right amenities, you can put this fear to rest. Mobile homes do not have to feel tight. On the contrary, many people love the freedom their mobile home has given them. Instead of being tied down to one spot permanently, your backyard can be ever changing. Living in a mobile home allows you to pick up your life and move with limited restrictions. For this reason, the tinier and more portable the home, the better. With a mobile house or tiny house design, it is crucial to make every inch count. It is common with tiny homes to see smaller scale furniture, but this doesn’t have to be the case. It is not about downsizing furniture necessarily but using efficient amenities. Some coffee tables can actually open and convert to a desk for a quality workspace. It is common to see sliding or folding doors in the interior living space. These make the most efficient mobile home doors. This is crucial because if these doors are left open, no additional space is being compromised. Out-swing doors are always a good idea to maximize interior square footage and avoid accidents. A space often forgotten about is the outside. Typically, with mobile lifestyles, it is common to incorporate the outdoors into your living space. After all, porches and patios make fantastic sitting rooms, weather permitting. Don’t neglect your patio space. With modern, outdoor furniture, often times you can achieve a stylish décor, while still getting the benefits of weather resistant fabrics and outdoor designs. Living in a mobile home or tiny home doesn’t necessarily mean being on the road and never at home. On the contrary, you will want to spend even more time there, and with the correct setup, have your friends over too. With a little creativity and planning, you can host a dinner out on your patio, while still providing a homey atmosphere. Most people seeking a mobile lifestyle prefer the outdoors and want to flaunt their scenery. Why not showcase the view by taking the party outside? With the right weather conditions, an outdoor event can be even more welcoming and entertaining than the dining room. When embracing the mobile home lifestyle (or even just a road trip in your RV) consider adapting your style a bit. Sometimes all the accessories and bulky furniture can take away from the bigger picture. Mobile homes inspire travel and this lifestyle allows you to see all areas of the world, not just the same house in the same neighborhood. Having less baggage or possessions allows you to get up and move when it’s time for a change of scenery. The less weighing you down, the more pleasant packing and relocating can be. Consider a minimalist design. Not only does having less clutter feel lighter, it gives your home a more chic and stylish look. It is much easier to clean and care for a space that isn’t clogged with unnecessary items. Keeping only your necessities on-hand will allow you to focus on your travel goals and won’t weigh you down with materialistic things. 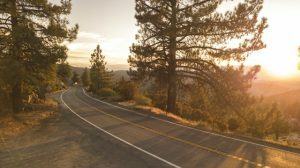 One of the best benefits of tiny house living or owning a mobile home is the ever-changing scenery. The backdrop of your home can be the deciding factor in where you park it. Also, if you don’t feel like you can commit somewhere long-term, portable homes keep your living situation fresh and unique. Mobile living allows you to pick up your home and move with no strings attached. If your goal is to see as much of the country as possible, don’t let owning a home force you to settle in one location. Keep your living options portable with the convenience of mini-homes. Other than a heart for travel, one of the most appealing things of mobile homes or tiny houses is the cost. Cheaper than buying a stationary home, mobile homes give you the freedom of relocation without the hefty price tag. When you get the itch to move, you can pick up and go without fear of market value or realtor fees. Best of all, you get to take your home with you. A mobile home makes nomadic lifestyles work for you, without sacrificing the comforts of home and embracing your travel ambitions. This entry was posted on Wednesday, June 27th, 2018 at 7:53 pm	and is filed under Uncategorized. You can follow any responses to this entry through the RSS 2.0 feed. You can skip to the end and leave a response. Pinging is currently not allowed.